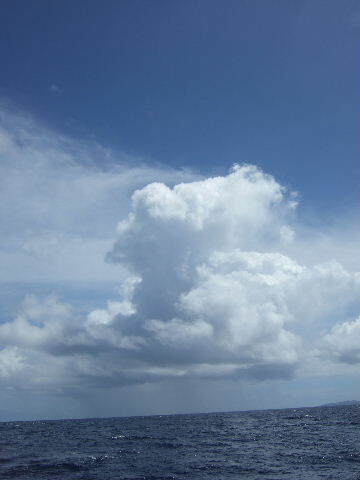 Another early start as we up anchored, leaving Dominica for Guadeloupe, another 50+ mile passage. The wind had continued to drop overnight and despite the risk of strong winds around the end of Dominica, we set off with only 1 reef in the main and only a few rolls in the genoa. The heading was again well west of north and the winds were on the beam, and it wasn’t long before we had the full working genoa out. Making around 6 to 7kts, it didn’t take long to cross the open sea gap to Les Saintes, a small group of very picturesque islands almost midway between Dominica and Guadeloupe. We had planned to visit Les Saintes as there are very good anchorages between the islands, but being French they have been affected by the strike. We had been told that it was quite peaceful there, but that the shops were empty and as we really want to get to Antigua, we decided we would try and stop there when heading south again in a couple of months time. So we kept going. The inter-island gap between Les Saintes and Guadeloupe is under the shelter of the south eastern part of Guadeloupe and so the seas were a lot flatter than the earlier part of the passage. Once in the lee of Guadeloupe we eventually lost the wind and had to resort to motoring, but part way up the wind came up from the north west. We thought it was just a flukey wind caused by the island and expected it to die again, but it stayed and rose to 10kts, so up went the sails and off went the motor – we were sailing again, close hauled at 5 to 6kts. The wind stayed in the north west for over an hour, then dropped and what there was, was dead on the nose. So we motored the last 10 miles into Deshaies (pronounced Day hay) on the north west coast of Guadeloupe, and en route we were joined by 2 Bottle Nose dolphins. 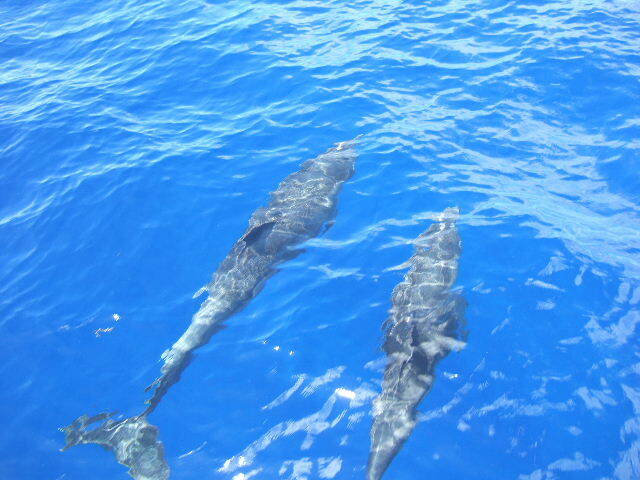 They were first dolphins we had seen since the first week of the Atlantic crossing back at the end of November. So we were very pleased to see them. They stayed for about 20 minutes, bow-riding most of the time, before heading off out to sea. When sailing up the lee of the islands we keep a couple of miles off, but the scenery is so spectacular that it feels much closer. 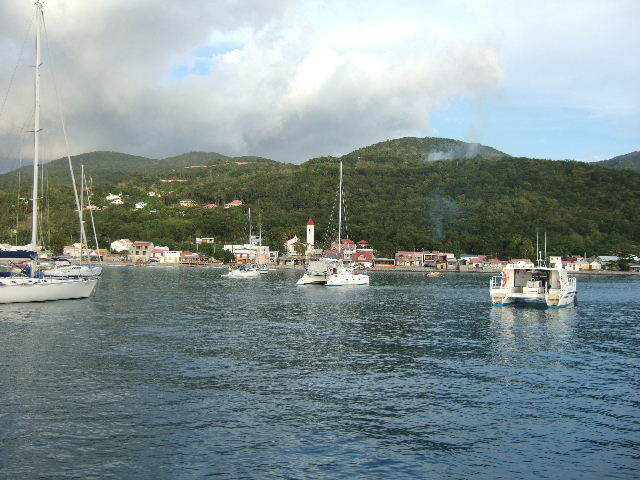 Deshaies is a lovely little bay and was full of boats at anchor or on mooring buoys. It looked like we would have to anchor in deep water again, but as we motored through the boats testing the depth, we found ourselves in a gap right in the middle, a gap big enough to anchor in 20ft of water if we got it right. So the foredeck crew (Michael) rushed into action and got the anchor ready and we dropped it there and then without going round and coming back, which we normally do. Our luck was clearly in, or we’re getting better, as we ended up just where we wanted to be, equidistant from all the boats around us. We thought it was too good to be true so the diving crew (Michael again) put mask, snorkel and fins on and went to see what was around us on the sea bed. There was nothing but sand and the anchor had dug in, so we went to bed feeling very secure and very pleased with ourselves. We woke up the next day only to find 2 French boats had come in overnight and anchored one either side of us and easily within swinging range had the wind come up! Generally we prefer to anchor at the back, so if we drag we wouldn’t hit any other boat and would only drag out to sea – not a problem when the next land is 1000 miles to the west! With the French strike, we didn’t go ashore, but both swam round the boat before eating and watching the sun go down. The sun sets very quickly here – there’s no twilight and it goes from light to pitch black within about 20 minutes.